Let's say you lived in a three-person house-share in SW4, Brixton, London. According to Hometrack, you could expect to pay around £767 per month, along with your two flatmates. With that money, you could comfortably rent a one-bedroom flat in Southend or Milton Keynes - both within commuting distance of the capital - all to yourself. In fact, you'd be able to rent a one-bedroom flat in 79% of British postcodes, including locations such as Bristol. Is renting cheaper in the next neighbourhood? If you wanted a bit more space, you could get a two-bedroom home in 65% of Britain's postcodes for £767 or less. You could live in L1, in the heart of Liverpool, where rents for a two-bed property are around £751. For the same rent or less, you could also get a three-bedroom property in Leeds (LS8) with money to spare. Or, if Leeds isn't for you, around 50% of all British postcode areas have an average price of £767 or lower for a three-bed. If you're in particular need of space, for the same price as a room in a Brixton flat-share, you can rent an entire four-bed property to yourself in 410 postcode districts across the country - including in cities such as Birmingham, Newcastle and Swansea and Glasgow. During the same period, home ownership among young adults has collapsed. In 1995-96, some 65% of middle-income 25 to 34-year-olds owned a home. Twenty years on just 27% do, with the biggest drop in London and south-east England. Renting a one-bedroom flat in England costs £600, yet buddy up with someone, and your share drops to £325. Find two flatmates, and you can get away with paying just £250 for a room in a three-bed home - less than half the cost of a one-bed flat. This will be no mystery to renters in cities such as London, where for many young people, flat-sharing is the only option. In the capital, the average one-bed costs £1,237, but a third of a three-bed property costs £582 on average, saving you more than £650 each month. Working out what proportion rent makes up of your salary is a good measure of how affordable it is. Housing organisations recommend spending no more than 30% of your income on housing costs. While Londoners earn more than residents of other regions, the city's rental properties still make up a bigger chunk of residents' salaries than renters in other areas. For example, renting just a one-bed flat in the capital eats up nearly half of the average salary. It will come as no surprise to anyone that London's rental market is the priciest. But rents have actually risen by more elsewhere in the country. The median rent for a one-bedroom flat in the East of England rose from £495 in 2012-13, to £650 in 2017-18, according to official figures. That's an increase of almost a third. In particular, rents in Cambridgeshire rose by two-thirds in that period, from £450 to £750 a month. 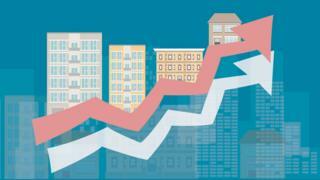 Other big increases were found in Barking and Dagenham, Bristol, and Greenwich, where prices rose 40% or more. We don't have local authority data for the other nations, but we do know that across England, there were only eight local authorities where one-bed rents fell. Three were in the North West, four in the North East, and, perhaps surprisingly, Kensington and Chelsea in London. Even within large cities, you might still find rents that are less eye-watering if you look in the right place. The data reveals the importance of location in determining how high your rent is likely to be. The cheapest corner of London's postcode area (SE2, in Greenwich) is more expensive than the priciest areas of most of the country's major cities. However, the number of areas with extremely expensive rents means that it still has the biggest price gap. To rent a one-bed flat in three London postcodes - SW1X, W1J and EC2R - you'd need to fork out more than £3,000 every month. But there are still three London postcodes - SE2, SE28, SE9 - where you can rent a one-bed for less than £1,000. 7. What about shared ownership? Shared ownership lets residents part-buy, part-rent a property. This means they'd pay a rent, service charge, and a mortgage on the bit they own (which usually ranges from 35% to 75%). These costs add up, but not - as it turns out - more than renting. We looked at the total costs of all the shared ownership listings within a five-mile radius of central London, and matched them up to the equivalent rent for that postcode. Two-thirds of the shared ownership properties were actually cheaper than renting in that area. But don't get excited that shared ownership is affordable in London - the average shared ownership home listed still takes up almost 70% of young Londoners' incomes.